Retina Specialist, Dr. Faiz Khaja gives hope to many people in fear of losing their eyesight. He treats patients with retina conditions associated with diabetes, macular degeneration, accidents and injury, cataracts, and other vision threatening conditions related to the retina. Dr. Khaja knew early on a career in medicine was in his future. A local kid who graduated from Fairfield High School, Dr. Khaja joined a program at Northeast Ohio Medical University (NEOMED), where promising high school students start immediately working on an undergraduate degree on their way to medical school. It puts advanced students on a carefully-defined program that requires a lot of discipline for success. His path to a career in medicine included work in Internal Medicine at Good Samaritan Hospital in Cincinnati, Residency at the University of Cincinnati, and a Fellowship in Vitreoretinal disease at Koch Eye Associates in Warwick, RI. Many of his patients are older and find that eye disease is taking away their ability to enjoy their lives. But Dr. Khaja can often positively affect this—using both traditional and new technologies to help stop vision damage or find ways to help patients maximize the vision they retain. Helping his patients in this way reflects his dedication to his faith and family. “If you ask me what has driven me since an early age to be a success, it has always been those two things,” Dr. Khaja states. Both are very important in his life and he puts equal time into both by taking exceptional care of his patients, and of his wife, children and extended family. His mentors include some of the most recognized medical professionals in the Cincinnati area. He is Board Certified by the American Board of Ophthalmology, and his professional affiliations include the American Academy of Ophthalmology and Cincinnati Society of Ophthalmology. He is an Assistant Professor of Ophthalmology at University of Cincinnati and has surgical privileges at Christ Hospital, University Hospital, Evendale Hospital, Bethesda North, and the VA Hospital. Dr. Khaja is very active in charity work through the Lions’ Club, a civic organization that has traditionally concentrated on helping people worldwide with vision problems. Dr. Khaja has made several mission trips to San Miguel in El Salvador and Comayagua, Honduras to treat patients who otherwise would likely never receive treatment and are likely to lose their sight. “It’s a privilege,” Dr. Khaja said. 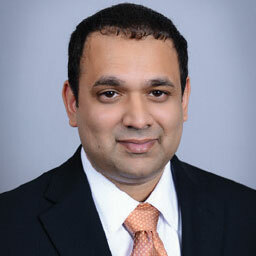 Dr. Khaja prefers to spend his free time with his wife and two children, along with their extended families. His hobbies include basketball, bowling, and table tennis. He lives in Mason. Fellowship in Vitreoretinal disease at Koch Eye Associates in Warwick, RI.